Holly, the receptionist at our office, hates it when I say, on the 25th of every month, “Only (335…180…90…30) shopping days til Christmas!” Unfortunately for Holly, having revealed that it gets to her, I make sure I never miss a month! But, a nice project takes so much time. 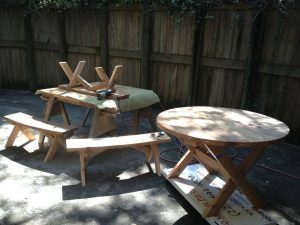 For example, I hope to make delivery on the round cedar picnic table with curved benches that I started on Memorial Day. “Hope” is the key word. I absolutely love working with cedar, despite its lack of forgiveness. The ultimate beauty is worth the sacrifices and do-overs. When our first grandchild arrived, I thought it would be great to make presents for her birthday and Christmas every year. I have enough ideas. Indeed, I have a list as long as a full-grown python of things I’d like to make. Now we have four grandkids, and eight presents a year is absolutely impractical, especially when you consider it’s taken me a year and a half to finish the picnic set. Instead, I make something for them when I can, and I try my best to make it beautiful and sturdy so they will want to hand it down to their descendants. What about you? Do you make your own woodworking gifts for the holidays? If so, let us know what you make in the comments section. Most recent projects include pepper/salt mills, exotic wood cutting boards, turned “inside out angels! Past projects were miniature bird house ornaments, lidded boxes, and finial icicles. I have made inside-out orm\naments, toothpick holders,bowls for Christmas time, also baby cribs for grandchildren & great-grand children. It is great to see grand kids to turn pens & other small objects while I can tutor them..